Tsar Bomba (Russian: Царь-бомба) is the nickname for the AN602 hydrogen bomb, the most powerful nuclear weapon ever detonated. Also known as Kuz`kina Mat` (Russian: Кузькина мать, Kuzka’s mother). 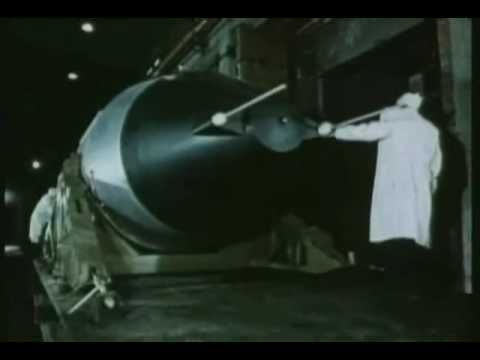 Developed by the Soviet Union, the bomb was originally designed to have a yield of about 100 megatons of TNT (420 PJ); however, the bomb yield was reduced to 50 megatons in order to reduce nuclear fallout. This attempt was successful, as it was one of the cleanest (relative to its yield) nuclear bombs ever detonated. Only one bomb of this type was ever built and it was tested on October 30, 1961, in the Novaya Zemlya archipelago. The remaining bomb casings are located at the Russian Atomic Weapon Museum, Sarov (Arzamas-16), and the Museum of Nuclear Weapons, All-Russian Research Institute of Technical Physics, Snezhinsk (Chelyabinsk-70). Neither of these casings has the same antenna configuration as the actual device that was tested. The Tsar Bomba is attributed with many names in literature: Project number – Project 7000; Product code – Product code 202 (Izdeliye 202); Article designations – RDS-220 (РДС-220), RDS-202 (РДС-202), RN202 (PH202), AN602 (AH602); Codename – Vanya; Nicknames – Big Ivan, Tsar Bomba, Kuzkina Mat’ (Kuzya’s Mother). The term “Tsar Bomba” was coined in an analogy with two other massive Russian objects: the Tsar Kolokol, the world’s largest bell, and the Tsar Pushka, the world’s largest cannon. Although the bomb was so named by Western sources, the name is now used in Russia as well. This entry was posted on Monday, June 13th, 2011 at 4:07 am and is filed under NUCLEAR WEAPONS. You can follow any responses to this entry through the RSS 2.0 feed. You can leave a response, or trackback from your own site.